All forms of tourism create environmental impacts, but these differ by orders of magnitude. At one end of the scale are minimal-impact wilderness travellers, either on foot or by water. 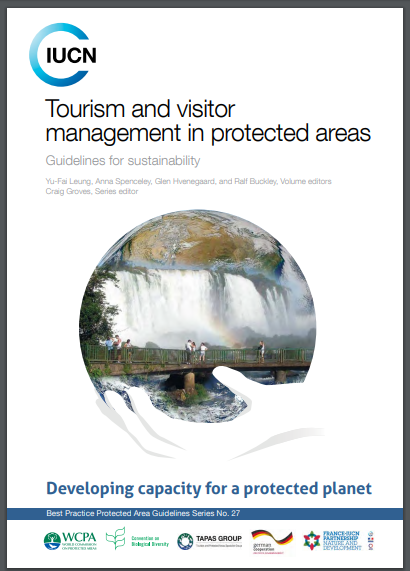 These are permitted in many protected areas worldwide, and there is a well-tested suite of management and monitoring tools, summarised in this volume, to provide benefits to visitors without compromising primary conservation goals. At the other end of the scale are large-scale infrastructure, accommodation, and catering facilities, some of which can handle over a hundred thousand visitors a day. Heavily-visited protected areas need these facilities, but there are dilemmas as to how best to provide them. Tourism development entrepreneurs, tourism industry associations, and tourism portfolios in governments see large-scale fixed-site developments as providing profitable opportunities. Private tourism developments in public protected areas have not always proved successful, however, and in some cases have created major ecological, social, financial and legal problems for protected area agencies. Managing the expectations, design and operations of infrastructure in and around heavily visited protected areas can present a substantial technical and political challenge for protected area agencies. This volume aims to provide practical advice on how to address these issues. Visitation and tourism can also create economic benefits for protected areas and surrounding communities and help to create greater support for conservation. In many developed countries, tourism in and around protected areas can encourage political support for protected areas and justify government budget allocations. The economic value of tourism and visitation, including social economic and welfare gains, as well as direct fees and revenues to protected area agencies, thus becomes a lobbying tool for conservation agencies and advocates. As the world attempts to meet the Aichi Biodiversity Targets for more effective protected area systems, conservation managers will need to work more effectively with other sectors. Tourism and visitation can be key tools in this expansion, but need professional skills and expertise to manage and maintain the ecological and conservation values of the sites being visited. This volume provides an introduction to such skills, relevant for protected area agencies and managers of conservation areas worldwide.